A couple months ago I did a massive wardrobe purge after I had a mini-meltdown over what to wear to Quilt Market. I've finally outgrown Ms. Frizzle as a style icon. My new goal of dressing Lisbeth Salander from The Girl with the Dragon Tattoo mashed up with a forest witch may not be that much more grown up, but having a predominantly black and gray wardrobe makes putting an outfit together pretty painless. The problem was, after 10+ years trying to erase/avoid my cringey middle school emo phase from my memory, I had a total of 2 black tshirts in my closet. This year I've been learning how to live happily with less, so building a capsule wardrobe of interchangable basics has become my current project. The problem is I hate clothes shopping. I was able to pick up a few staples at Goodwill and discount stores before caving in and trying Stitch Fix. It was a home run (I bought all 5 items my stylist picked), but I still needed some basic, everyday short sleeve tops. Time for DIY! 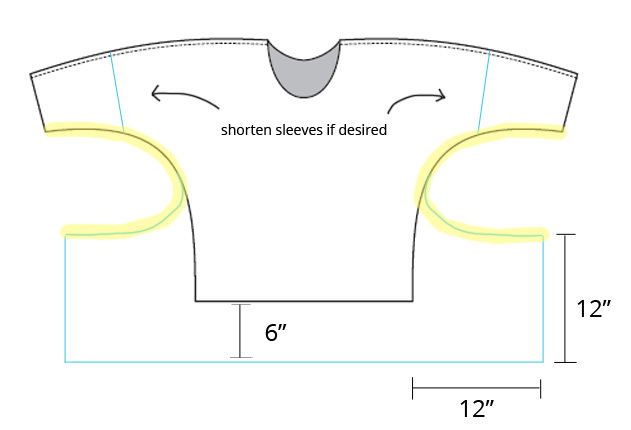 Shorten sleeves to desired length, mimicking the angle of the the original armhole hemline. Add desired length to top, 6" in my case. Add enough and you could even make a shift dress. Add a large rectangle to the bottom hemline and blend in to underarm seam. For my tops, I extended the new hemline 12" to either side, then drew perpendicular 12" lines straight up. From here, I started to draw another line parallel to the hem, and curved it upward to blend into that underarm seam. Repeat all your alterations on the back piece of the pattern (the only difference between the front and the back is the neckline) and you're ready to sew! The sewing process remains the same as the original One Hour Top. The only difference is your underarm seams are curved now (highlighted yellow in the image above). To finish my handkerchief hemline, I did a 3-thread overlock stitch with my serger. I did a traditional hem on my test top, but I prefer the decorative look of the serged hemline. As you can see, this weird rectangle becomes unrecognizable in your finished top unless you hold the hemline out. Isn't that cool?! 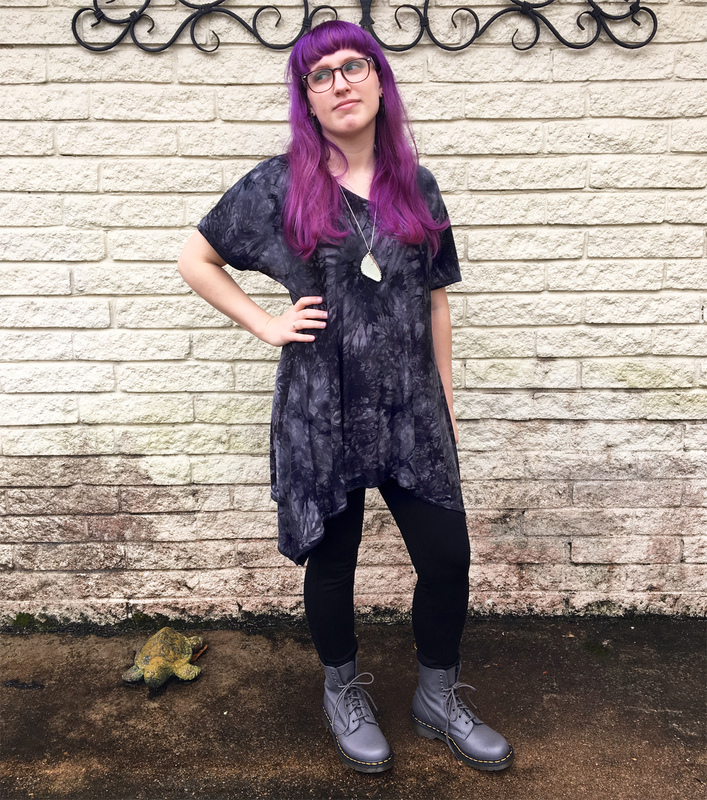 Including my test top, I've already made 5 of these tunics! 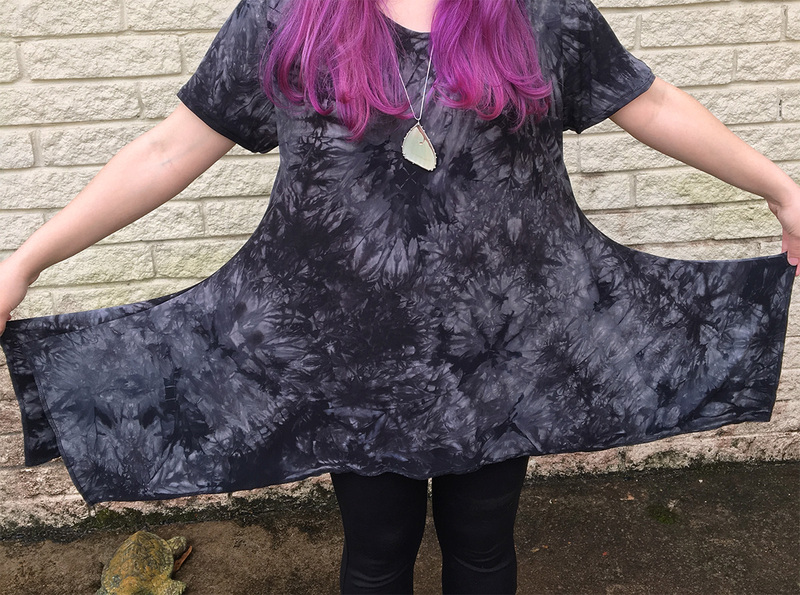 This one is made with the most gorgeous knit fabric I've ever encountered, a tie die rayon jersey. Of all the knits I purchased, this 95% bamboo rayon / 5% spandex blend was the easiest to work with too. The raw edges don't curl much (a huge pet peeve of mine) which takes the headache out of the cutting process. It's also heavenly soft. The only downside is I think the 60" width is incorrect; it's really more like 48" wide. Good thing Fabric.com has excellent customer service though. When I contacted them about the error, they sent me another 1.5 yards free of charge. That's enough to make a few pairs of leggings!